How humane a trap is on captured wildlife pests depends to a great extent on the trapper’s skill and use of the device. 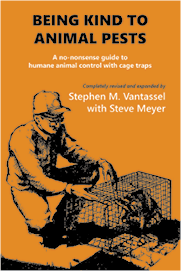 Editor’s Note: The following are excerpts from chapter 6 of Being Kind to Animal Pests, revised edition, newly published from wildlife control specialists Stephen M. Vantassel and Steve Meyer. The book, an update to Meyer’s original work, provides users of cage and box traps specific principles and tips to improve the humaneness of these devices. Learn more and order at http://wildlifecontrolconsultant.com/store-2/. In conversations regarding trapping, people like to refer to some traps being more humane than others. To some extent this is true. Improvements in technology have improved our ability to capture animals with lower injury scores. However, too often people focus so much on the technology (i.e., the equipment) they forget that the trapper’s expertise, or lack of it, is also an essential part of humane trapping. In my book, Dominion Over Wildlife? An Environmental Theology of Human-Wildlife Relations (2009), I wrote, “…a critical failure of the entire argument from cruelty lay with its excessive preoccupation with the trap.” Yet, their rhetoric repeatedly ignores that trapping involves the trapper-trap connection. Traps do not set themselves; the trapper’s skill in placement, choice, modification and set construction (i.e., baiting) plays an important role in reducing injuries and non-target captures. Trapping injuries can be addressed by reducing trap check times or using different traps noted below. Trapping is like legal work, it takes practice. Even experienced trappers regularly admit that the animals teach them new things all the time. A more realistic view of trapping is to recognize the trap and the trapper work in combination. To put it numerically, we could describe the relationship as an equation, trap choice minus trapper skill = suffering (8-4=4). Improved trap design would mean that the suffering associated with the trap would be lower to begin with. Couple the trap with an improved skill of the trapper and the suffering number can be low indeed (7-5=2).” So, while devices are important to improved humaneness in the capture of animals, they are not the only variable. The experience of the trapper is just, and sometimes, more important to humane capture than the trap he/she is using. As mentioned, cage/box traps do injure animals (Fig. 1). Contrary to popular opinion they are not automatically more humane (i.e., less injurious) than other devices. How humane a trap is on the animals it captures depends to a great extent on the skill and use of the device by the trapper, namely you. Here are some additional tips to reduce animal injuries in cage/box traps. Understand that you may not be able to use all of them at the same time. The point is to use your best judgement and make every reasonable effort to reduce animal injury/stress. Fig. 1. Gray squirrel with nose burn and damaged feet. SMALL TRAPS. Use the smallest trap necessary to catch the animal. This reduces injuries in two ways, by (1) preventing larger non-targets from entering the trap and (2) preventing an animal from having enough room to ram its body against the ends of the trap (yes animals do this). WATCH THE WEATHER. Animals can handle a lot of temperature extremes but be sure that they aren’t going to be trapped during a massive snow storm that is being predicted. Likewise, consider whether animals will be exposed to high temperatures created by sun and heat from hot surfaces like roofs and asphalt. ISOLATE TRAPS. Place traps away from where humans and pets may encounter them. Trapped animals feel vulnerable. Make sure they aren’t out in the open where crowds can find them. CONSIDER MICRO-CLIMATES. This is a fancy statement to remind you to think about how a trap’s location can affect the animal. For example, if trapping in summer, will the trap be exposed to the hot afternoon sun? Is the trap on the roof where it can bake the animal? Traps placed on roofs, for instance, often have excessive exposure to the sun and wind. The temperature on the roof can be magnified by the oven-like effect the roof will have in reflecting sun energy back to the trap. The same can occur with traps set in attics. On the other hand, setting a trap in an attic during winter is a better choice as the animal would have significant protection from the elements. Is the trap exposed to running water off a roof or downspout? Is the trap protected against excessive wind, rain or snow? If not, can you protect the trap in some way? Fig. 2a. Cardboard can be used as a durable yet disposable trap cover. Fig. 2b. Foldable plastic covers are available to cover traps too. SHELTER TRAPPED ANIMALS. Animals in cages are exposed to the elements. Always cover your trap at least 50% so that if it rains, the animal has a part of the trap available for shelter. There are several ways to accomplish this. All of them have their advantages and disadvantages. Wildlife control operators have used cardboard (Fig. 2a) as well as plastic commercial covers (Fig. 2b). In winter, consider using a box trap as they are several degrees warmer than cage traps. But be careful in summer as box traps can heat up the animal due to lower air flows. I did a study that compared internal temperatures of a box trap (plasticatch), covered (50%) cage trap, and ambient air for an entire year. The temperature sensors found that box traps were about 4°F hotter than the surrounding air and about 2°F warmer than the covered cage trap. A good compromise is to cover 50% of the cage trap plus the back end. This allows the animal to have a sheltered area for some protection against sun and rain/snow. But it also allows the animal to move out to the unsheltered area if it needs to catch a breeze. Be aware, however, that trapped animals can damage covers, sometimes severely. CHECK TRAPS DAILY. Reducing the amount of time an animal spends in a trap goes a long way to reducing the animal’s injury and stress. Ideally, check the trap at the time it will be going to sleep in its den if it wasn’t caught. For diurnal animals (those that come out during daylight hours), check traps late in the day. For nocturnal animals, check traps early in the morning. FOLLOW THE LAW. Take the time to learn the wildlife laws in your country, state, and locale. Many laws are written to protect wildlife from unnecessary injury and the public from unnecessary exposures.